Brian Olson, Evan Bernd, Emma Parins, Kaityn Ewe and Claire Olson work on scenery for their high school Service Learning Challenge. ​03/08/16: Parent Meeting - Regional Competition Information 7:00 p.m. - 8:00 p.m. JLMS. 03/25/17: DI Regional Tournament: Kennedy Middle School; Germantown from 8:00 a.m. - 6:30 p.m.
04/08/17: Wisconsin State Tournament: University of Wisconsin - Stevens Point, 2100 Main St., Stevens Point, WI 54481 (top two teams of each level of the competitive challenges at the regional tournament advance). Overnight from Friday 04/15/16 through 6:30 p.m. on 04/16/16..
05/22/17 - 05/28/17: Global Final Tournament: University of Tennessee, Knoxville, TN (top two teams of each level of the competitive challenges at the state tournament advance). District bus transportation / housing in the UT campus dorms. 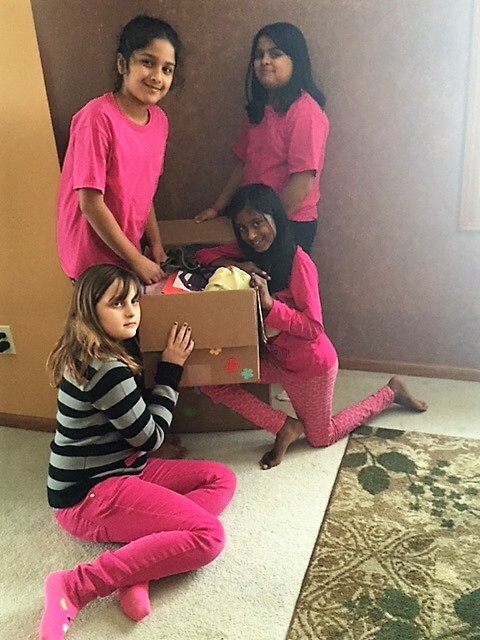 Team Smiling Seals from Grafton Elementary proudly show one of their boxes of clothing they collected for their service project. All items were donated to Foster Parents in Ozaukee County!